Copyright: (c) 2003-2010, PathologyOutlines.com, Inc.
M Galvani, D Ferrini, F Ottani. Eur J Heart Fail 2004; 6: 327–333. left ventricular dysfunction on admission or during hospital stay. (4) in patients with ST elevation myocardial infarction or no ST elevation ACS. Y Endo, S Kohsaka, T Nagai, K Koide, M Takahashi, et al. Br J Med Med Res 2012; 2(4): 490-500. The population was predominantly male (69.3%), and the mean age was 66.6±15.3 years. Patients with higher BNP levels or detectable TnT had a worse prognosis (BNP45.0% vs.
compared to those with increased levels of BNP or detectable TnT alone (log-rank p<0.001). 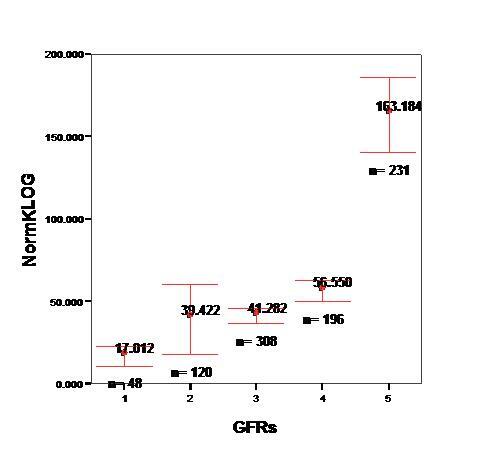 A similar trend was observed in the subgroup of patients with CKD stage III–V (n=172). DS. Silverberg, D Wexler, D Sheps, M Blum, G Keren, et al. JACC 2001; 37(7). 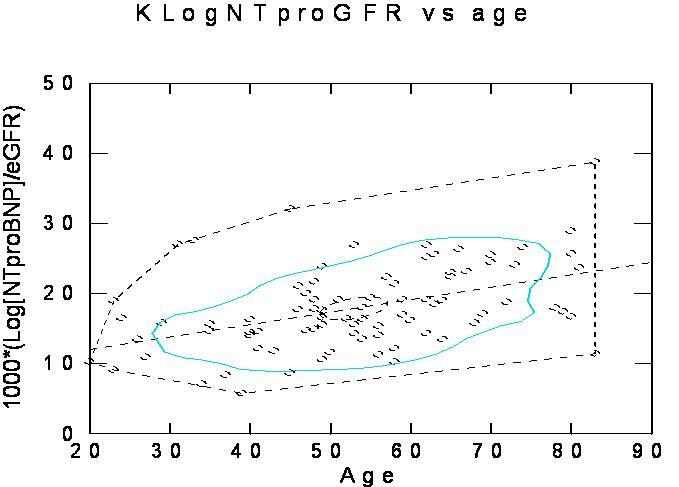 What is the best approximation of reference normal for NT-proBNP? Journal of Medical Laboratory and Diagnosis 04/2011; 2:16-21.
resulting in altered volume status or myocardial filling pressures. removal of the major co-morbidities that affect an increase in this peptide in serum. papers likely is due to increasing concurrent comorbidity with age. NT-proBNP profile of combined population taken from 3 sites and donors. Figure 1. 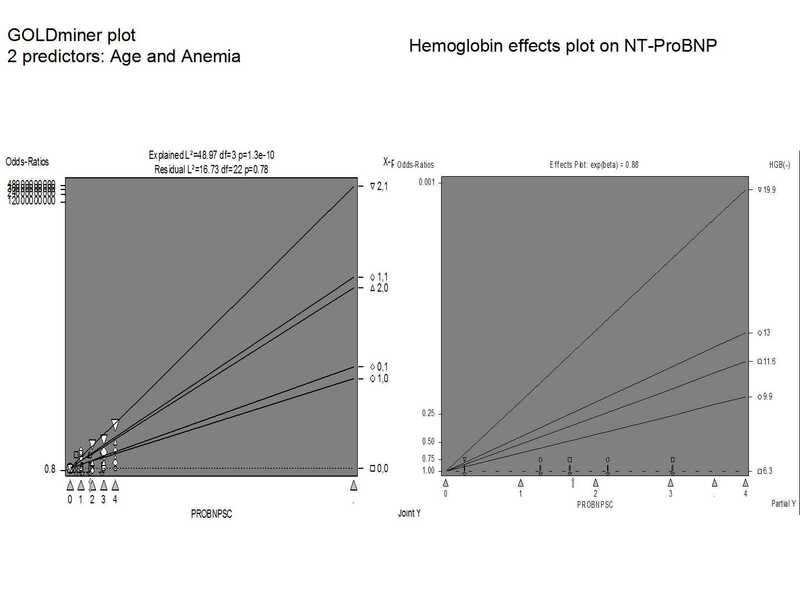 Plot of NT-proBNP sensitivity and specificity with RI prevalence. GFRe scale: 0, > 120; 1, 90- 119; 2, 60-89; 3, 40-59; 4, 15-39; 5, under 15 ml/min. 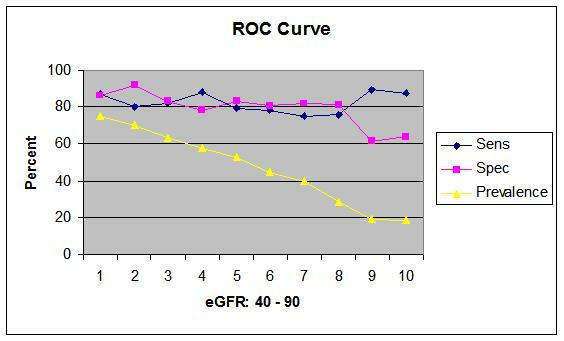 NKF staging by GFRe interval and NT-proBNP (CHF removed). correcting these large effects in the whole sample population. (iv) Adjust to age under 50 years by multiplying by 0.66 and 0.56.
to 1.73 m2 body surface area, which is an accepted average adult surface area. RRJ. van Kimmenade, JL. Januzzi, JR, AL. Baggish, et al. JACC 2006; 48(8). : 1621-7.
previous criteria of a clinical diagnosis of heart failure. Januzzi, R van Kimmenade, J Lainchbury, A Bayes-Genis, J Ordonez-Llanos, et al. 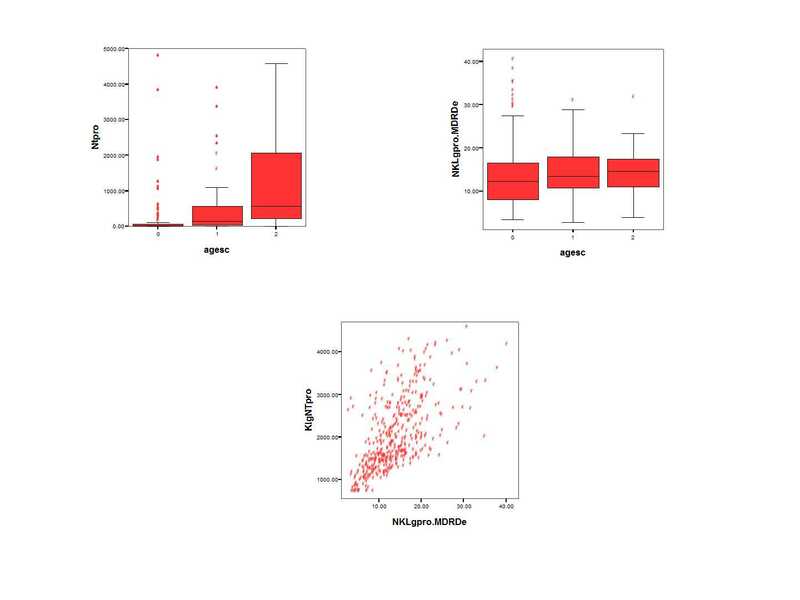 prognosis were identified and verified using bootstrapping and multi-variable logistic regression techniques. of death by 76 days [odds ratio = 5.2, 95% confidence interval (CI) =2.2 – 8.1, P < 0.001]. RW. Troughton, CM. Frampton, HP Brunner-La Rocca, M Pfisterer, LW.M. Eurlings, et al. Eur Heart J Mar 2014; 35, 1559–1567. years) patients [0.62 (0.45–0.85); P = 0.004] but not older (≥75 years) patients [0.98 (0.75–1.27); P = 0.96]. BA Groenning, I Raymond, PR Hildebrandt, JC Nilsson, M Baumann, F Pedersen. Evidence Report/Technology Assessment – Number 142. Agency for Healthcare Research and Quality. C Balion, PL. Santaguida, S Hill, A Worster, M McQueen, et al. Question 1: What are the determinants of both BNP and NT-proBNP? measurement in patients with symptoms suggestive of HF or with known HF? to the traditional diagnostic measures of HF in patients with suggestive HF? with diagnosed CAD and HF? Question 4: Can BNP or NT-proBNP measurement be used to monitor response to therapy? Diagnosis: In all settings both BNP and NT-proBNP show good diagnostic properties as a rule out test for HF. 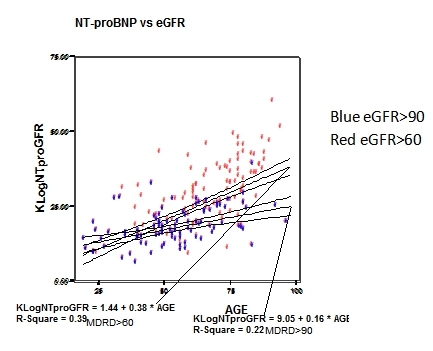 determine the value of B-type natriuretic peptides for screening of HF. show change in response to therapies to manage stable chronic HF patients. patients will be enrolled by the end of 2012.
and who would not have been known using only signs and symptoms of heart failure as it is currently the practice. SP. Collins, CJ. Lindsell, CA. Jenkins, FE. Harrell, et al. be generated to predict risk for death and serious complications. test the prediction rules in a heterogeneous patient cohort. P Welsh, O Doolin, P Willeit, C Packard, P Macfarlane, S Cobbe, et al. Eur Heart J Aug 2012.
and appears related more strongly to the risk for fatal events. increase in log NT-proBNP] after adjustment for classical and clinical cardiovascular risk factors plus C-reactive protein. proBNP by 19.8% (95% CI: 13.6–25.9%) compared with 9.8% (95% CI: 4.2–15.6%) with the addition of C-reactive protein. E Lubien, A DeMaria, P Krishnaswamy, P Clopton, J Koon…A Maisel. C Newton-Cheh, MG Larson, RS Vasan, D Levy, KD Bloch, et al. Nat Genet. 2009 Mar; 41(3): 348–353. CI = 0.85–0.95, P = 2 × 10−4, respectively). DC. Goff, Jr, DM. Lloyd-Jones, G Bennett, S Coady, RB. D’Agostino, Sr, et al. to reduce CV risk, and management of blood cholesterol, overweight and obesity in adults. more limited in scope and focus on selected CQs in each topic, based on the highest quality evidence available. of Recommendation/Level of Evidence (COR/LOE) construct (Table 1) and is expressed in both formats.